Small towns attract my attention as they always have a story to tell. The former hub of railroad activity inThomas, West Viriginia is no exception. Situated on the banks of the North Branch of the Blackwater River, it served as a major railroad stop in the area years ago. All the buildings on Front Street are on one side of the road with the river running along the other side. Stores still handle a variety of items. 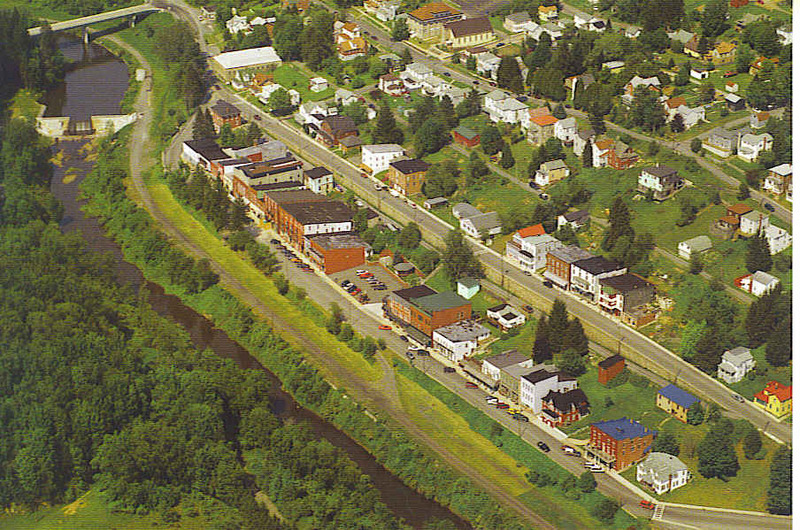 Built on the side of the Allegheny Mountains, this town was incorporated in 1892. However, it actually received its start in 1880 when Henry and Thomas Davis began building the West Virginia Central & Pittsburg Railroad along the river there.You can already see where the town received its name! Railroads were needed as easy access to transport natural resources of coal and timber from the Tucker County area. While the railroad went through several transitions of ownership, the last train rolled through Thomas in 1983. The business district that remains today is a result of the railroad industry.Today this small town has given real importance to their history by placing informative signs throughout the town. After the advent of the railroad, many people from foreign countries settled here. There were as many as 18 different nationalities, many of them from Europe, which brought with them the European wrought iron design for their balconies. One particular building was constructed back in 1908 by Russian Jewish immigrants, Schilansky and Rubenstein. 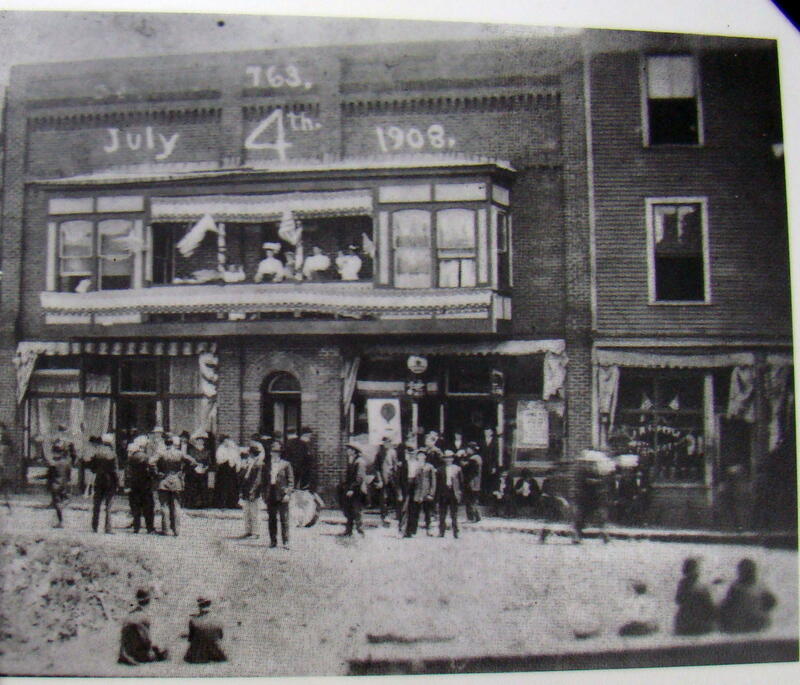 Schilansky came to the United States as a pack peddler and when he arrived in Thomas continued at that occupation until he had enough money to open a general store and a saloon. Soon he was joined by the Rubenstein family,who he had met in New York. This stylish Victorian building had a wooden balcony with turned spindles. Both families lived upstairs to conveniently run the general store below. Today a stroll down the street captures the spirit of those long ago days. Shop owners and signs show small town pride exists in abundance. A popular local establishment today is the Purple Fiddle. 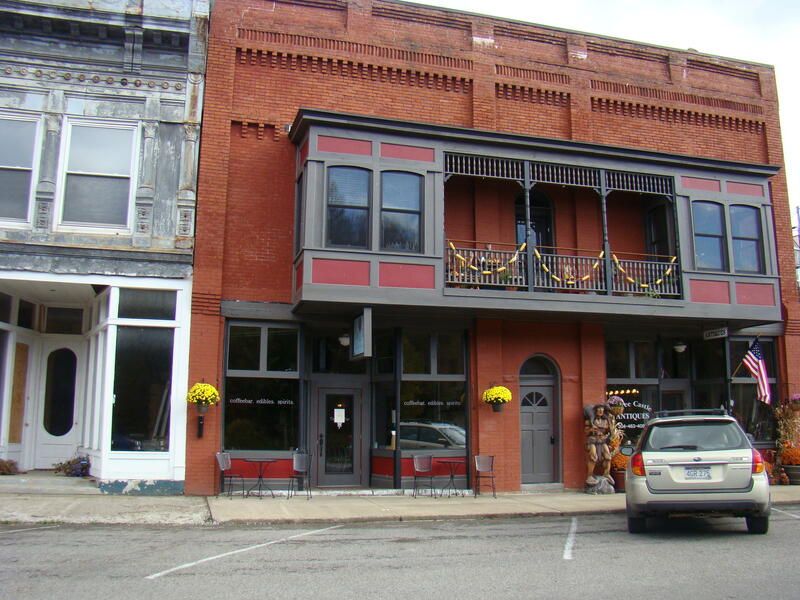 Bands entertain nightly here, and it is a great place to quench your thirst with a sarsaparilla drink. Those who hang out here are a unique group of individuals with artistic abilities and stories to tell. 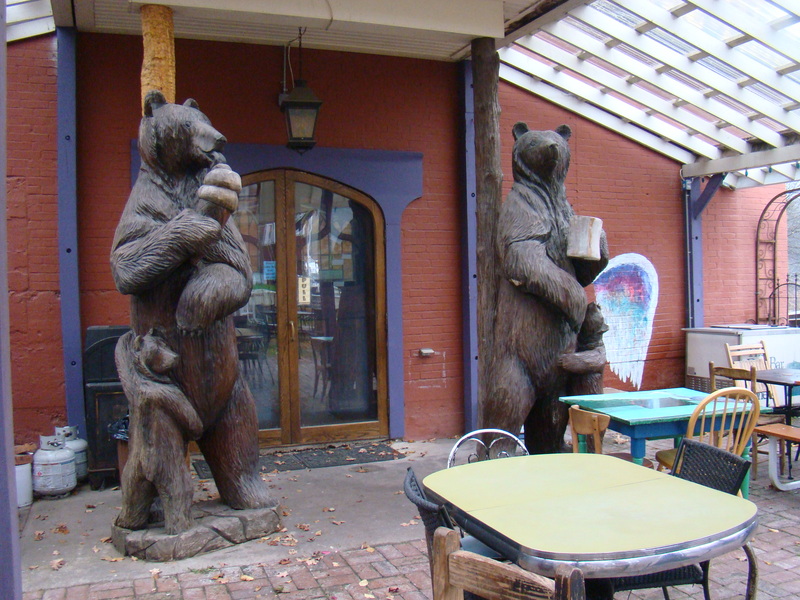 Their outside deck has an attractive setting with wooden carved bears watching over the action – one licking an ice cream cone, while another holds a refreshing mug. Benches with ski backs line the street. 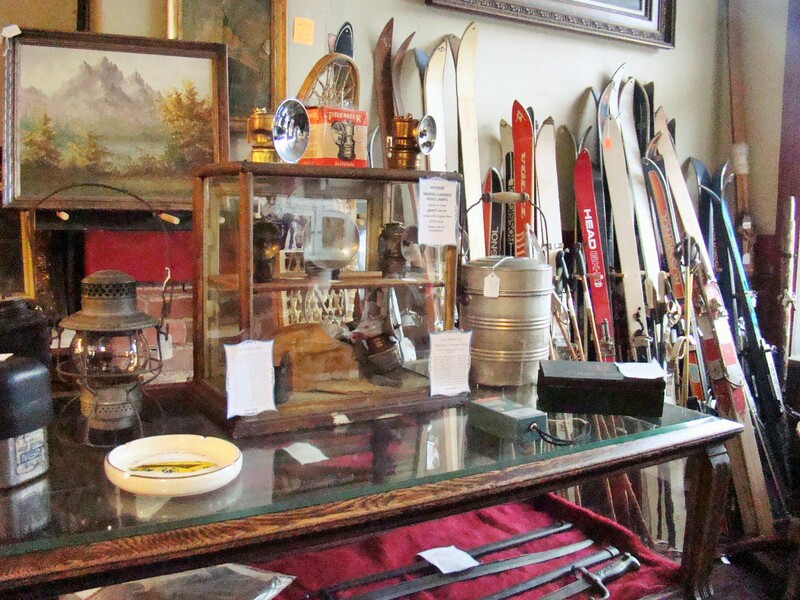 Stores today hold a wide variety of items from antiques to ski related. 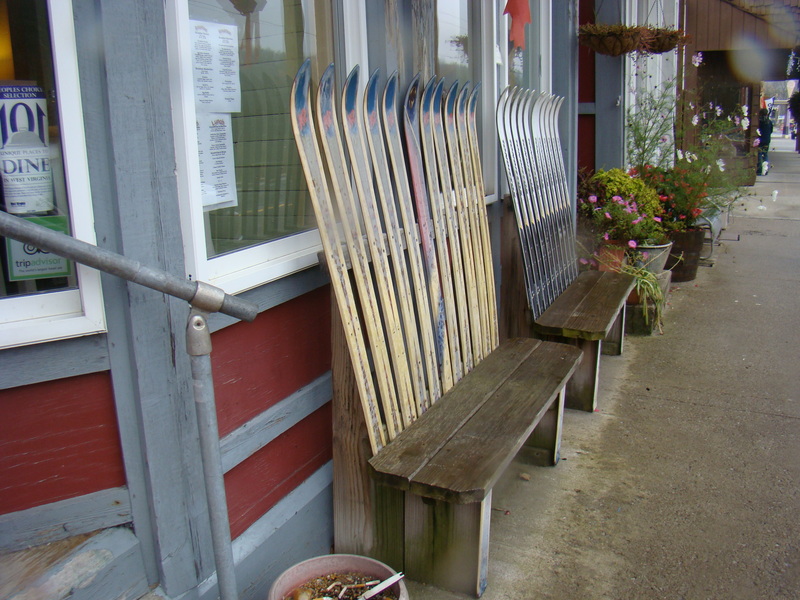 Since the town is situated near several ski resorts, skis even form their benches, where visitors can rest while watching the river, traffic and people flow by. Thomas, WV is located southeast of Morgantown off US 219. This is definitely off the beaten path, but that is what adds to its charm. Quaint little town. I think I’d enjoy a sarsaparilla! The sarsaparilla was as refreshing as the occupants of the small town. Thanks for stopping by. Thanks for stopping by. Enjoy a beautiful day.